I’m heading out west for a few speaking events that I’m really looking forward to. 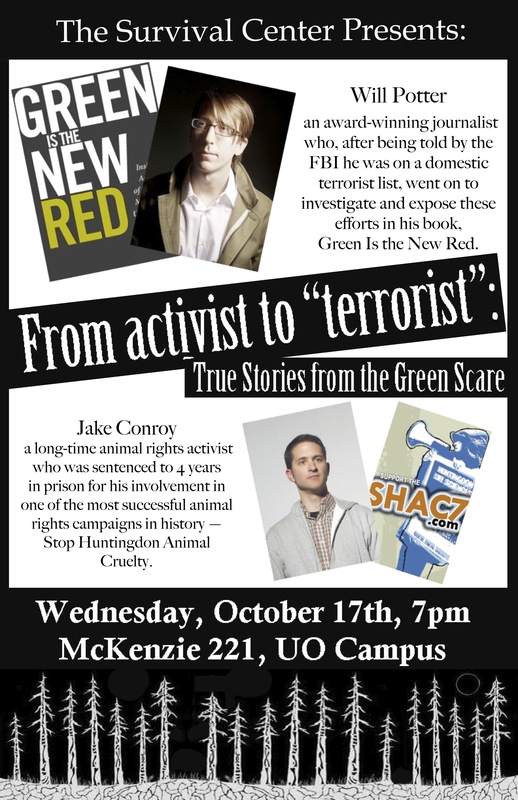 At two of the events I’ll be presenting with Jake Conroy, a long-time animal rights activist who was sentenced to 4 years in prison for his involvement in one of the most successful animal rights campaigns in history: Stop Huntingdon Animal Cruelty (SHAC USA). Jake will discuss being the target of a multi-agency terrorism investigation, learning he was on a high-profile prisoners list, and navigating living a life branded as a terrorist in post-9/11 society. I’ll discuss how corporations manufactured the idea of “eco-terrorism,” and why all social justice activists are at risk. 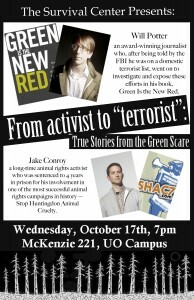 I’ll be discussing the corporate-led attempts to criminalize undercover investigators who expose animal welfare abuses. 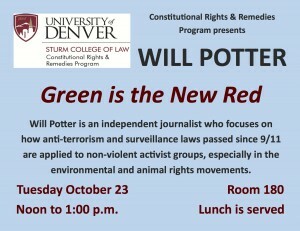 I’ll be discussing how anti-terrorism and surveillance laws passed since 9/11 are applied to non-violent activist groups, especially in the environmental and animal rights movements. If you’re in town I hope you can make them, or help spread the word!